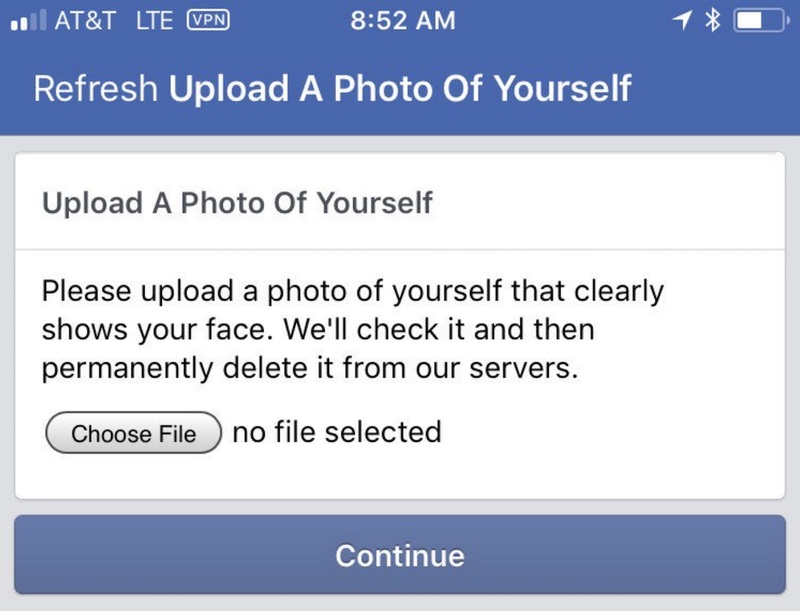 Facebook users are beginning to notice a new account verification test on mobile devices that asks for them to upload a clear photo of their face, which will then be used to confirm that they are a real person, similar to other basic captcha tests that prove human users are not a bot. The selfie verification test has been around since at least earlier this spring, but the story is just now beginning to spread after more users have shared screenshots of the test on Twitter (via Wired). Facebook told Wired that this new photo test was created to "help us catch suspicious activity at various points of interaction on the site, including creating an account, sending Friend requests, setting up ads payments, and creating or editing ads." Every step of the process is automated, from the moment when Facebook flags an account for suspicious activity and asks for a photo verification, to the actual process of checking the uniqueness of the uploaded photo, meaning you'd have to upload a picture not previously shared on Facebook. Once the process is done, Facebook said that it will "permanently delete" the image from its servers. This is one of "several methods" the company uses to detect suspicious activity. Earlier in November, Facebook announced a trial for a "non-consensual intimate image pilot" program, where part of the process asked users to send such images to themselves on Facebook Messenger. This was intended to eventually prevent any of these images from being spread online by reviewing and hashing the image, "which creates a human-unreadable, numerical fingerprint of it." This way, if someone else did try to share the image on Facebook, the company's database of hashes would spot the image and prevent it from being uploaded. As with any of Facebook's tests, it's unclear how widely available the new image verification system is currently, or if it will expand to a wider user base in the future. According to a deleted Tweet spotted by Wired, if Facebook asks you for the photo log-in you might be locked out of your account completely until you provide the image, with a message stating: "You Can't Log In Right Now. We'll get in touch with you after we've reviewed your photo. You'll now be logged out of Facebook as a security precaution." No thanks, I give FB only minimal information. Hopefully they won’t require this when I finally get around to deleting my account. "suspicious activity at various points of interaction on the site, including creating an account, sending Friend requests, setting up ads payments, and creating or editing ads." I'm sorry, but I think I'm missing something here. Isn't that what FB is for, as in... normal usage? Right away, sir. Any other parts? A pic of my rear is what they can get..